Moscow in the "Circle of Light"
Moscow city tries on different colors as the “Circle of Light” festival kicks off. All branches of light painting art occupied the Moscow center for five days (from 28th September till 2d October). Artists from over 30 countries present their recent works for muscovites. The architects of Saint Basil’s Cathedral, GUM, Historic museum on Red Square, the Arc in the Gorky Park couldn’t even imagine that once in the 21st century their works will become a base for modern light painters. Those who are afraid of cold weather, but also want to join the party, have a chance to do so in the Central house of Artist. There the “Laboratory of light” demonstrates the latest achievements of the world’s 40 most notable light painters. This year festival's topic is the Energy of life. The tradition of light festivals was brought from Europe. Millions of people flock to the streets of Berlin and Lyon during the days of light festivals, often held in autumn. 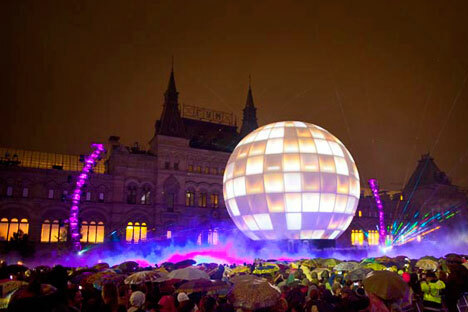 The success of the show spread to Moscow as well – millions of people watched the light fest events last year. And the new one is in the full swing and rearing to gather twice as much.